Yesterday I have published a tutorial on clearing the browser cache which is an essential thing to know. Today I'm going to show you how to delete cookies from your PC, which is another basic but very helpful thing to know. This article addresses only standard cookies, not Flash cookies. Cookies are small files that can be placed on your computer when you visit a website. They often serve as identifiers and sometimes to store custom parameters in. Cookies are for instance used to store session information after you log in to a website. Without the cookie set, you would need to log in again on every new page that you open on that website. There are other means to keep track of those information, but cookies are the most common form and used by the majority of Internet sites. Cookies can also store parameters. When you comment on a blog you sometimes see an option to save the user information (your name, email and website). These information are then stored in a cookie as well. Not all cookies are helpful on the other hand. 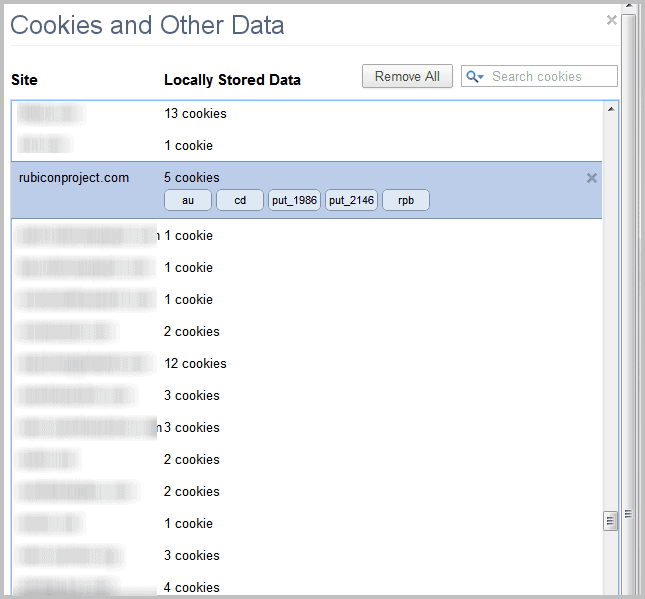 Tracking cookies are used to follow your movement on the web. Advertisers use these information to create a user profile to show you relevant advertising. If you visit lots of car websites you may see more car related ads on websites. Sometimes you may need to delete cookies on a computer. You may have used a public computer and want to make sure that all your session data stored in cookies is deleted or you want to limit the tracking capabilities of marketing companies. All web browsers offer the means to delete cookies right in the browser. 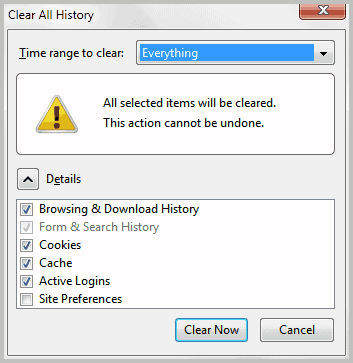 To clear cookies in Internet Explorer do the following: Start the web browser and click on Tools > Safety > Delete Browsing History. Make sure Cookies is selected. A click on Delete removes all Internet Explorer cookies from the system. Sometimes you may want to delete specific cookies only. To do this click on Tools > Internet Options. 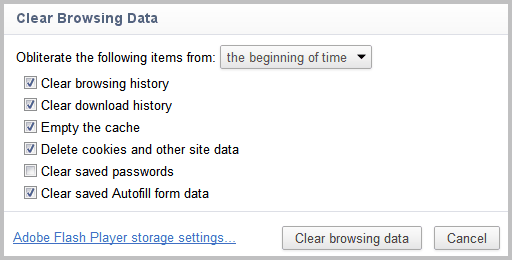 Locate the Settings button under Browsing History in the General tab. Click the View files button there. 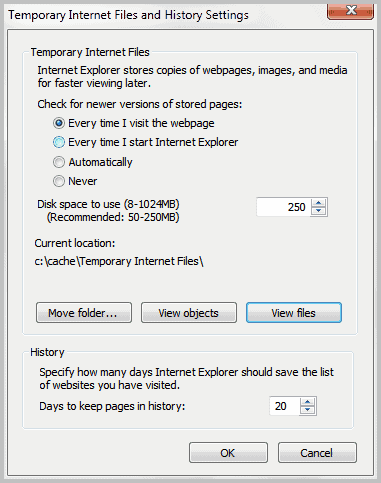 This opens the temporary Internet files in Windows Explorer. 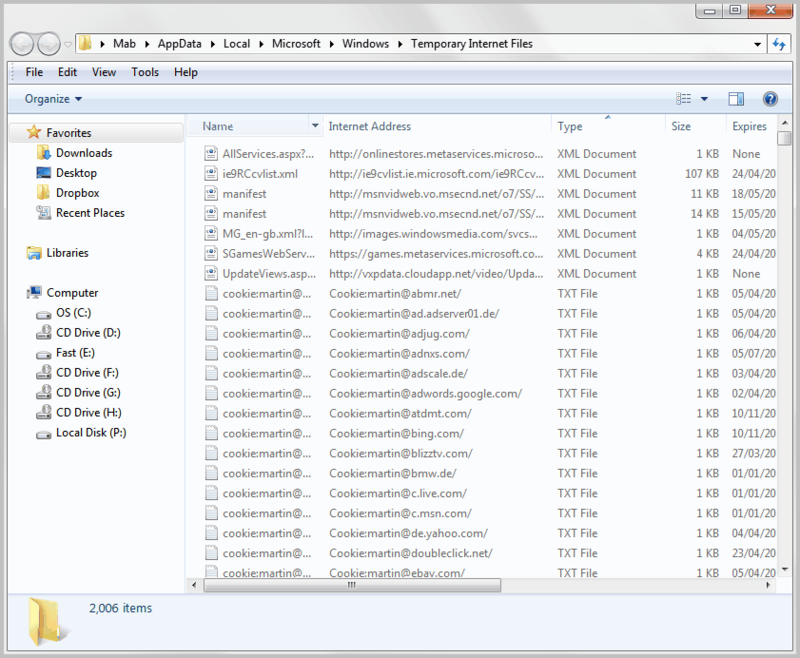 My suggestion would be to change the folder view mode to details and sort the files by name or Internet address. You can now delete cookies selectively in Windows Explorer. Tap on the Alt-key and click on Tools > Clear Recent History or press Ctlr-Shift-Del to open the configuration window. 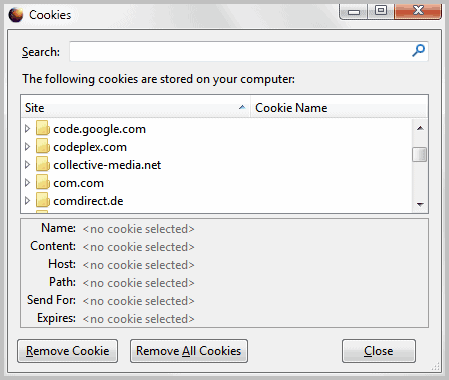 Here you can clear all cookies stored in the Firefox web browser. Make sure to select everything from the time range pull down to delete all cookies. Tap on the Alt-key and click Tools > Options > Privacy if you want to delete only some cookies in the Mozilla Firefox web browser. Select Show Cookies from the interface. This opens a list of all cookies that are currently stored in the web browser. Simply select a cookie from the listing and click the remove cookie button afterwards to delete that cookie from the browser. 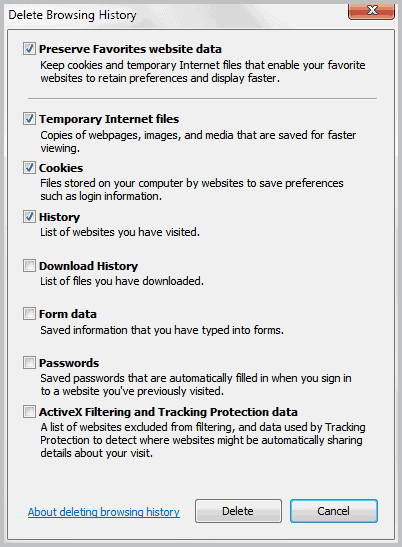 Click on Menu > More Tools > Clear Browsing Data to delete cookies in Google Chrome. Google Chrome is currently the only browser that links directly to Adobe Flash Player storage settings which makes it easier to delete Flash cookies as well. The delete some cookies in Google Chrome open chrome://settings/content in the address bar and select the All cookies and site data button. All cookies stored in Google Chrome are listed on that page. Just click on a cookie and then on the little x on the right side to delete that cookie. 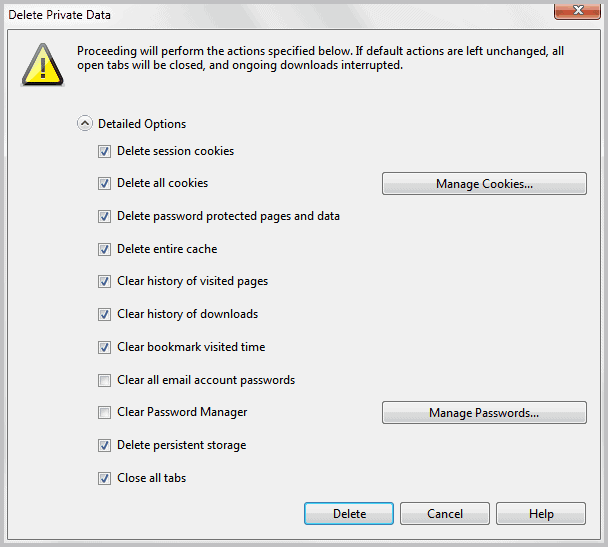 Opera users need to click on Menu > Settings > Delete Private Data to delete cookies. They can delete all cookies under that menu, or click on the Manage Cookies button to see a list of all stored cookies on the system, and options to delete them selectively. Update: In the new Opera browser, use Ctrl-Shift-Del to open the cookie deletion menu or select Opera > History > Clear browsing data. You can use third party programs to delete cookies. They offer several benefits, especially for users who work with multiple web browsers as it allows them to delete cookies from all web browsers in one go. 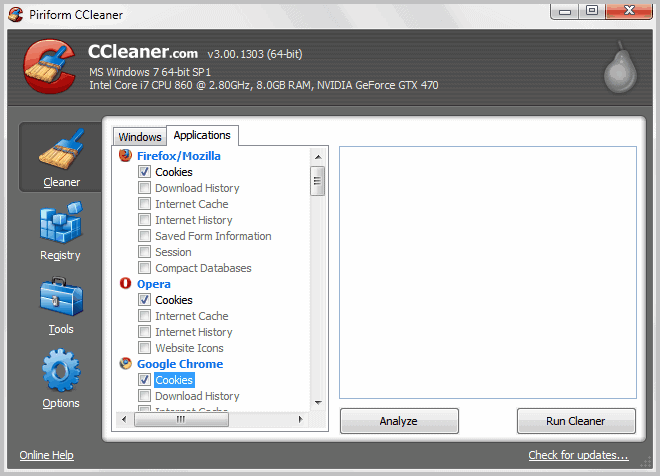 CCleaner is such a program. It is freely available, and even comes with a filter list to keep some cookies on the system during deletion (I have recently shown how to do that in Firefox as well, see Configure Firefox To Delete All Cookies On Exit But Select Ones for a detailed guide on the topic. Find out how to delete all or selected cookies in Google Chrome, Firefox, Internet Explorer and Opera. It cannot be the cookie change that you made. Do you run any extension or script for YouTube in Chrome? Try CCleaner and delete all Chrome data using it. You need to close Chrome for that process. Also make sure Chrome is up to date. it worked fine and now you tube doesnt work. i followed suggestions on original post to undo which lead me to this page. do you know if there is a way to simply restore youtube page script ? You can restore the original functionality by clearing all YouTube cookies as this is all the script does. I would suggest you clear the browser cache as well just to be on the safe side. If that does not work, try a different web browser just to see if you can open YouTube in that browser or not.